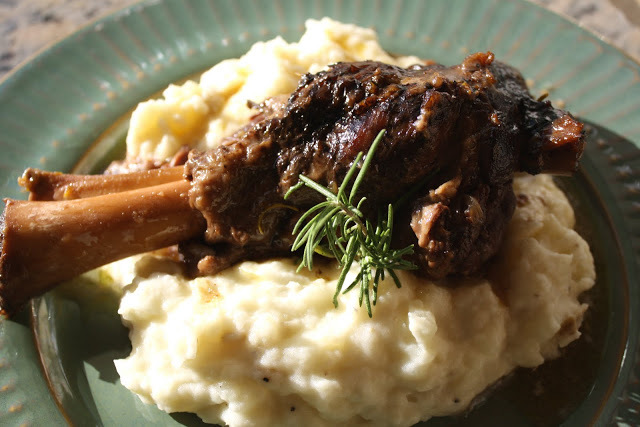 Snuggle in with this crock pot adaptable slow braised lamb shank recipe which utilizes our superlative, ultra-fresh, extra virgin olive oils in two separate elements of the recipe. *This recipe can be made in a Dutch oven or crock pot. If using the oven, preheat to 300 degrees F. In a wide shallow dish or a gallon size re-sealable bag, mix the flour, salt and pepper. Rinse and pat the lamb shanks dry and dredge in the flour. In a large heavy bottom pan, heat the olive oil over medium-high heat, and brown the lamb shanks until golden brown on all sides, taking care not to over crowd the pan, cooking for about 5 minutes per side and set aside. In the same pan, add all of the vegetables and sauté over medium heat, scraping up any browned bits, until the onions are translucent, for approximately five minutes. Pour in the wine and simmer for another couple minutes and then add cup of hot water. Add the fresh rosemary to the bottom of the crock pot or Dutch oven and arrange the shanks on top. Pour the wine and vegetables over the top. Cook, covered in a heavy Dutch oven for six hours or in a crock pot set on low. After six hours, carefully remove the shanks from the liquid taking care not to allow the meat to slip off the bones. Cover to keep warm. Strain and de-fat the braising liquid. Place in a small saucepan and reduce by half. Adjust the seasoning with sea salt and fresh ground pepper. Pour the reduction over the lamb shank placed atop a bed of mashed potatoes made with ultra-fresh Olive Us olive oil, such as Garlic, Butter or a single varietal UP extra virgin olive oil.